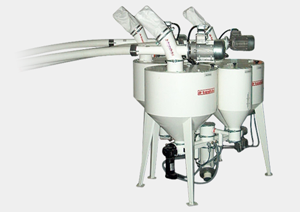 The TRANSITUBE DCL model metering units are used to continuously meter virgin materials (pellets or powder) and regrinds with adjustable and even throughputs. The metered products are then conveyed and mixed in a transitube feeder that will automatically feed the moulding machine or extruder hopper. For each product, the metering spiral is equipped with an inner tube that evens the output flow and keeps the metering tube constantly filled. The metering spiral is driven by a fixed speed gearbox motor for the virgin material and a DC variable speed motor for the regrind. Variable outputs are controlled from the electrical control panel. The metering spiral speed determine the percentage of virgin and regrind. 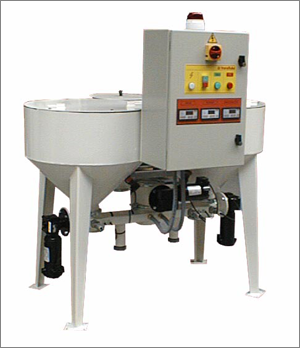 The metered products are then conveyed by a TRANSITUBE flexible mechanical feeder which mixes and blends everything together, automatically filling the machine hopper. Thanks to even and regular proportioning of the components. Of weighing, tumbling, and manual manipulations.